Description: Glabrous annual herb 10-20 cm high with a single stem branching distally or from near the base; leaves basal and cauline, alternate, twice- or thrice-ternately compound, ultimate divisions filiform, broadly ovate in outline, basal leaves usually withered by flowering; umbels terminal and axillary, pedunculate, compound, with 4-7 rays bearing umbellets of 3-6 flowers; involucral bracts absent, involucel bractlets 1-4, linear, 1-3 mm long; flowers perfect, minute, with white petals; schizocarps broadly ovoid, 1.2-1.5 mm long, with three somewhat indistinct, rounded dorsal ribs, lateral ribs similar to the dorsal, surface with irregular corky banding perpendicular to the ribs and a few scattered multicellular tubercles on the ribs, tubercles sometimes with a straight, hair-like point. Flowering late March to early May. Similar Species: Both Spermolepis echinata and Spermolepis lateriflora are found in the same area and have prominent hooked hairs on their fruits that readily distinguish them from Spermolepis organensis. Cyclospermum leptophyllum has simple umbels and prominently ribbed schizocarps without tubercles or irregular corky banding. Ammoselinum popei has much larger (>3 mm long), urceolate-oblong, papillate schizocarps. Distribution: New Mexico: Dona Ana County, on the northeastern bajada of the Organ Mountains. Habitat: In sandy and gravelly soils derived from quartz monzonite at elevations of 1400 to 1650 m (4600 to 5400 ft). The type specimen was collected near a spring at the lower edge of Madrean chaparral, with Quercus, Juniperus, Cercocarpus, Garrya, and Rhus. Plants found in the spring of 2016 were found in Prosopis glandulosa / Eragrostis lehmanniana shrub savannah. Remarks: This species was named by Guy Nesom in 2012, based on a single specimen collected by Laird McIntosh in 1995. Searches around the type locality by multiple botanists in 2013, 2014, and 2015 were fruitless, and perhaps it does not persist at the type locality. In 2016 it was abundant in a band of habitat extending from 2.5 to 4.5 miles northwest of the type locality. No further searches were made at the type locality in 2016, though. Conservation Considerations: The habitat where it was found in 2016 has been degraded by grazing and invasive species, and continues to be grazed. Prior to grazing, this was likely black grama grassland, but now it is dominated by honey mesquite and Lehmannâ€™s lovegrass. Some annuals are sensitive to ecological degradation, while others do better in disturbed habitats. We do not know enough about Spermolepis organensis to guess in which category it falls. There are no other apparent threats to Spermolepis organensis. Nesom, G.L. 2012. 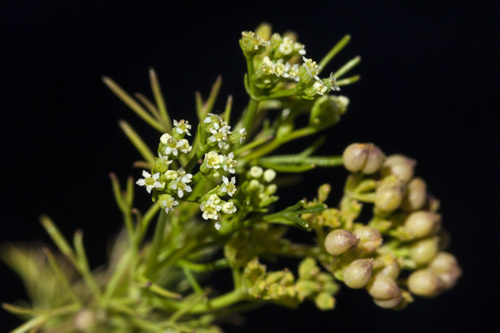 Taxonomy of Apiastrum, Ammoselinum, and Spermolepis (Apiaceae). Phytoneuron 2012-85:1-49.